Dragon is a free-flying, reusable spacecraft developed using the best of 21st century technology by SpaceX under NASA's Commercial Orbital Transportation Services (COTS) program. Dragon is made up of a pressurized capsule that will carry pressurized cargo on this mission and an unpressurized trunk that houses its solar panels and can be used to carry unpressurized cargo. Dragon represents the best of cutting-edge technology. SpaceX developed Dragon from a blank sheet to its first mission in just over 4 years. In December 2010, Dragon became the first privately developed spacecraft to return safely from orbit - a feat previously achieved by just three nations (the United States, Russia, and China). Dragon is 4.4 meters (14.4 feet) tall and 3.66 meters (12 feet) in diameter. The trunk is 2.8 meters (9.2 feet) tall and 3.66 meters (12 feet) wide. With the solar panels fully extended, the vehicle measures 16.5 meters (54 feet) wide. Although this demonstration mission carries only cargo, Dragon was designed from the outset with crew- carrying capability in mind; SpaceX is in the process of developing necessary systems for transporting crew, such as seating, a launch escape system, and environmental control and life support systems. Dragon has the most powerful heat shield in the world; designed in cooperation with NASA, it is made of a material called PICA-X, a high- performance variant on NASA's original Phenolic Impregnated Carbon Ablator (PICA). Dragon is capable of carrying over 3,310 kilograms, split between pressurized cargo inside the capsule and unpressurized cargo carried in the trunk. While this mission is carrying cargo only, future Dragon missions will be capable of carrying 7 passengers in the crew configuration. Designed for lift during reentry for precise landing and low g-forces. Draco Thrusters: Eighteen Draco thrusters used for orbital maneuvering and attitude control (providing system redundancy). Powered by nitrogen tetroxide / monomethylhydrazine (NTO/MMH) storable propellants; 90 lbf (400 N) thrust used for on-orbit maneuvering, de-orbit burns, and re-entry attitude. Power: Two solar array wings on trunk (8 panels total). Avionics: Two-fault tolerant avionics system with extensive heritage. Communications: Communications between Dragon and the ISS are provided by COTS UHF Communications Unit (CUCU). CUCU was delivered to the Space Station on STS-129. The ISS crew commands Dragon using the Crew Command Panel (CCP). Dragon can also communicate on S-band via either tracking and data relay system (TDRSS) or ground stations. Environmental Control System: Astronauts will enter Dragon to remove cargo. The craft provides a habitable cabin with air circulation, fire detection and suppression, lights, pressure control, and pressure and humidity monitoring. Thermal Protection System: Primary heat shield is made of tiled Phenolic Impregnated Carbon Ablator (PICA) fabricated in-house. The backshell is made of SpaceX Proprietary Ablative Material (SPAM). Parachutes: Dual drogue parachutes slow and stabilize the craft before three main parachutes bring it to a gentle landing. Dragon can also land safely with only one drogue and one main parachute if needed. Transporting Crew: To ensure a rapid transition from cargo to crew, SpaceX has designed the cargo and crew configurations to be nearly identical, with notable exceptions including the need for a crew escape system, the life support system, and onboard controls that allow the crew to take control from the flight computer when needed. 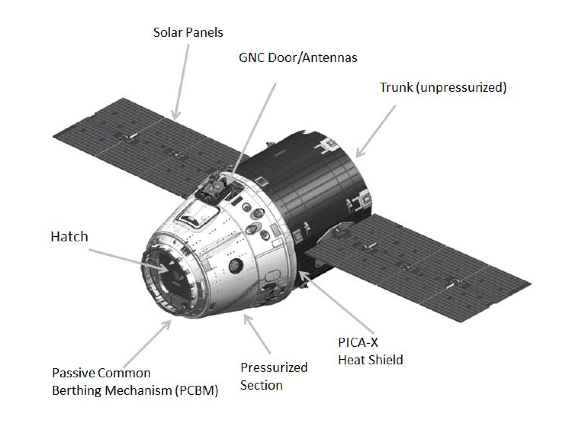 This focus on commonality minimizes the design effort and simplifies the human- rating process, allowing systems critical to Dragon crew safety and ISS safety to be fully tested on unmanned demonstration flights and cargo resupply missions.